In this post, I will make a review of the best SEO strategies and actions in 2015 to help you stand out in the search. 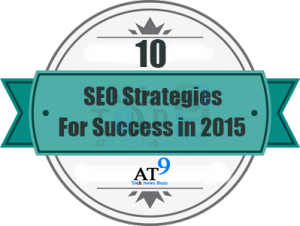 So, I would like to say out few like 10 SEO strategies to get good success in this year 2015. Hope, these strategies work out best to everyone. Once if you look back into the year 2014 and just crossed, we can see how the Google algorithm has been updated 13 times. I’m not superstitious but strikes me the number of times that Google has made changes in one year and increasingly these are done in a shorter period of time. Here, I will list the SEO strategies that I think these strategies will have a big impact on the 2015 rankings of our blogs. Google increasingly giving more importance to have a good site structure, consistent and coherent. But still, in 2015 there are many websites which do not have a good sitemap, navigation and icon working model. This seems to be a big drawback towards the Google search engine. We have to make our blog with good sitemap so that the search engine index our content easily. Structure of the website consistent: The structure and hierarchy that you give in your website will directly affects the SEO. Having a sitemap: There are different plugins that can do the work for you in WordPress (as many of them were using WordPress now). The most used Plugins for WordPress are the SEO by Yoast and Google XML Sitemaps. I suggest the latter one because you can perform more and advanced configuration indexing. Have a Google Webmaster Tools account: This is very simple to do. Create an account and verify the webmaster account with your site and can do with Sitemap. Check your Google Webmaster tools regularly for the updates of your site from Search Engine. Have a Google Analytics account: It’s about creating an account and add the tracking code to your website. Everyone does this, but forget to see their website analytics. Don’t forget to track your results on day to day when you apply different strategies on your site. Review of broken links: We will create many backlinks from many sites. Some of them are like PR9 or may below. But, we never know which site will exist longer and which site will close soon. So, take a few time to review the broken links and solve them to get good authority for your website/blog. To detect these broken links I recommend two very simple tools such as Broken Link Checker and Dead Link Checker. Stability of the server: If you are using WordPress take care of the hosting. So, we have to take care of server monitoring. I recommend you free tool UptimeRobot and you will see the updates of the web server that how often it falls. In 30 seconds you’ll be monitoring your server. The speed of the page: In 2015, Google will continue to increase the value of this factor in SEO. So it’s time to design your webpage, which will load very quickly. Complete an SEO review: We do blogs, SEO, Tags and all. So, I suggest you to take an SEO audit for your site to get an clear analysis about the excess use of H1 tags, meta tags and all. This will make us to improve our site in SEO rankings and can make our site look perfect in further. User behavior is very important as per SEO in 2015. User behavior is the key strategy in 2015. This will create an strong impact on our site rankings. CTR: The most important factor is user behaviour. So, we have to try to get to increase the CTR of our post. Bounce: We have to try to minimize the bounce rate of our site and for this, the most effective way is changing a little in the first paragraph and make it more attractive. But we can also introduce some visual element that allows us to retain more user time. Time check in the post: If you write a post it takes to read five minutes and we have a visiting time too. We have to see that users leave the reading half of it. Average time of visits: The average of all visits, if we consider the improved time of visits by post, we can see that how it improves the average total visits. A number of views: This is an SEO factor that not much mentioned, but it is very important as it tells you how popular is our content. A number of views makes better SEO. Selecting a good issue to get thousands of hit every month. Long run keywords which give good traffic are to be selected for the best results. Do good keyword research and select the keywords with the aim of getting thousands of hits per month with one post. So, I suggest the SEMrush tool is spectacular as we can analyze all the best aspects such as monthly searches, level of competition, number of results, etc. Writing quality content is like betting to all bloggers. We can see such a great content rarely. When we write a great article we will get organic backlinks and can be shared in different blogs. By this way, we can increase our blog authority and get backlinks and shares organically which Google loves the most. The best article in this blog is about Google AdSense, which got more shares, backlinks and also ranking on the first page of Google for the different keywords. Trying to position the keyword that is not within the reach or have the best level of competition. Choosing words that are not popular in the search engine. Writing articles which are not in best search. This leads to a loss of traffic. Avoid filler content or lesser value. There are many people who think that having a responsive theme or template is done. But, actually, it is not, because the site may load slow nor not responsive in mobiles, and this is a key factor because if our audience is consulting our site from a 3G or 4G connection, the loading speed on mobile devices will be essential to sales, customers, etc. If you do not have a responsive design your website will lose a lot of traffic because you are going against the trend and user behaviour. When doing a good mobile design note the guidelines of Google Mobile. Here, you can also analyze your website to see if your web design is user-friendly to mobile devices. A little tip: If your theme is not friendly with mobile devices, then I recommend you to install jetpack and activate the “set themes for mobile”. To accelerate the speed of the mobile version, analyze your website with PageSpeed Insights and follow the prompts. Google is already adding special searches performed from mobile devices labels, it makes you to pay more for the optimization of content for mobile devices or lose a large number of visitors. The visual marketing is here to stay and has no place in all the SEO strategies that pride themselves in 2015, because it is a natural way to improve our SEO and all at a great speed. SEO experts are not strangers to the Infographics. We can see many SEO experts who are using Infographics in the articles for the better attraction of visitors to our blogs. Are these infographics are effective in improving our SEO? Does it serve any type of graphics for inclusion in our SEO strategy? The infographics are the best tool for the blog. As many of them say that a picture speaks millions of words then a paragraph. Also, users attract for the image type view than a long paragraph. So, using infographic makes us to built good backlinks. So, that many of them will give backlinks to our site as they are using our content in their infographic. In this way, we can built organic backlinks and can increase the authority of our site. So, go for infographics with attractive colors and easy use of content. I suggest Adobe photoshop for the best design of Infographics. For our blogs, we use the same tool for a better look and for clear vision. If you do not know how to use this tool then I recommend you to begin your first infographics with piktochart certainly it is the simplest free tool to create infographics. All spells that Pinterest and Instagram are 2 very important social networks driven by the momentum and popularity of computer graphics in 2015. Create a social media profile and publish your content in your social media profile which gets you to very near to your fans. This will be the best exposure platform for your site content. In 2015 the Social Network will be an important SEO factor, but not just because so basic that we all know to get social bookmarking, but because they are mean to connect and reach agreements with other professionals that drive web positioning of our brand. Using Social Media marketing strategy can be a good SEO strategy that allows us to attract many social visits. If we connect with influencers on social networks then we can get our publications to reach hundreds of thousands of people in a few hours. Exchange of quality post: The goal of this collaboration is to gain visibility with another audience (another blog different from yours) and get links pointing to post that we want to position. This is a very common and widespread in the field of digital marketing and social media practice. Release Agreement on Social Networks: It is also very common and it can provide very good results, attract more social views and a greater number of markers. Exchange subscription Feedly: This strategy is less widespread than earlier but each one is used more, and the reason is more and more people use Feedly for our healing tool header content. Invitation to a relevant professional: Here we are not interested in doing link building. So, actually what we want is to invite a relevant professional for granted cache and quality to our Blog. Team of collaborators: I am not going to cheat, this will be my next goal, create a group of serious partners involved several times a year in my Blog. In a few weeks, you will see the section on my Blog. Personal branding is very important to each and every blogger. Because a branding profile is enough to make good exposure for our blog posts. We can get likes, comments, shares and many more. So, try to built a good social media profile and build branding with good and genuine strategies. The social engagement is perhaps one of the most persecuted goals in 2015, because if your brand reaches a good engagement you will get your publications to reach many people, and will also be an attractor for other professionals who want to offer partnerships. So, the more influential thing is your brand in social media that will convert more engagements and will improve the blog positioning. Phase 1: Link Building quantity. Phase 2: Quality Link Building. Phase 3: Link Baiting quality. This means that we have gone from a link building from quantity to quality one in 2014, but in 2015 we enter the golden age of link baiting. Go on with the guest blogging in 2015 and always bet to publish quality content, and a link containing the same subject that extends or add value to linked content. The days of using general keywords are coming to an end. Do not be dazzled by thousands of visits you could bring that keyword because they probably have a very high level of competence and very difficult to position. Focus on your efforts and use more precise words and help yourself . Use related searches which are offered by the Google search engine by itself and build the Long Tail. This is very important for each and every blog. Take care about the backlinks for our site. Observe regularly and keep safe from negative SEO. Through email marketing strategy we can get many visitors to our Blog. Feedly helps subscribers to follow you on Feedly and that will make your content fly by the social environment by simply clicking on the button to publish the Blog. This is one of the strategies that have been more encouraging and that has helped many to get a number of subscribers. Google Plus is a social network that I love most, and that has allowed me to meet and connect with real cracks of digital marketing and social media. If we realize it at its full potential we can generate interesting discussions on our publications . Google+ social markers are very important in SEO. The degree of engagement of infographics is formidable in this social network. Google + is a social network which has a great number of users and shares a best stuff. Being an influencer on Google Plus can be one of the best SEO strategies in 2015. Corrects all technical faults in their website. Devote special attention to those SEO factors that come from user behavior. Select the topics of your content and make a firm commitment for publishing quality content and value. In 2015 mobile visits exceed those of computer, if your website is not optimized for mobile devices, you will lose a significant portion of visits. The visual marketing has to have a place in your marketing strategy. Start creating infographics and disclose in the social environment. Social Media is not a complement to the SEO but an essential element in any strategy. Social networking is essential in any marketing strategy. Making agreements and collaborations with other professionals in your industry will improve your organic visibility. Devote special attention to improve your influence on the social environment, the more influential’re in the social environment, the easier it will improve your SEO. In 2015 center yourself in obtaining links and put aside for building links. Being an influencer on Google Plus is one of the best SEO strategies to improve your SEO. The days of using general keywords are coming to an end. I hope these SEO strategies will help boost in 2015 the SEO of your online projects. SEO is more important for successful blogging. Your strategies about SEO 2015 really correct. I really appreciate your post. It will help for bloggers to drive traffic from 2015. Thank you Vignesh Waran for your appreciation. And I hope this will work for other bloggers too. These are my experiences and from those these best strategies for SEO are live here. thankx for sharing this new strategies..